A girl's friendship with a lonely black hole leads her to face her own sadness in this original, funny, and touching middle grade novel for fans of Crenshaw and Flora & Ulysses. 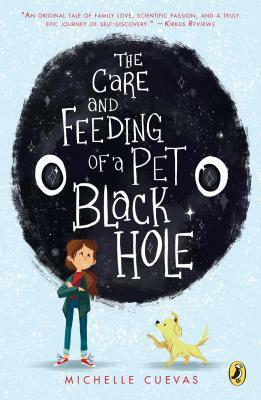 When eleven-year-old Stella Rodriguez shows up at NASA to request that her recording be included in Carl Sagan's Golden Record, something unexpected happens: A black hole follows her home, and sets out to live in her house as a pet. The black hole swallows everything he touches, which is challenging to say the least—but also turns out to be a convenient way to get rid of those items that Stella doesn't want around. Soon the ugly sweaters her aunt has made for her all disappear within the black hole, as does the smelly class hamster she's taking care of, and most important, all the reminders of her dead father that are just too painful to have around. It's not until Stella, her younger brother, Cosmo, the family puppy, and even the bathroom tub all get swallowed up by the black hole that Stella comes to realize she has been letting her own grief consume her. And that's not the only thing she realizes as she attempts to get back home. This is an astonishingly original and funny adventure with a great big heart.